Based on the Intel X58 and ICH10R chipset, which is the high-end platform for Intel's LGA 1366 Core i7 processors with QPI 6.4 GT/s, the Gigabyte GA-X58A-UD3R delivers bulks of next generation features that gaming enthusiasts and power users have been waiting for. The Gigabyte GA-X58A-UD3R includes Gigabyte's 333 Onboard Acceleration features. Incorporates USB 3.0, Serial-ATA Revision 3.0 (6Gbps) and a 3x USB Power Boost, as well as multi-GPU support for NVIDIA 3-Way SLI and ATI CrossFireX and support for Intel's high performance processors, every part of the system performance is reaching to the cutting-edge levels. With the memory controller integrated directly into the processor die, the Gigabyte GA-X58A-UD3R also supports triple channel DDR3 memory for blazing fast memory performance. System durability and security are as important as ever. Gigabyte's DualBIOS system has a second BIOS chip on the motherboard for quick and painless recovery from crashes and viruses. Count on Gigabyte's experience and innovation! The new Intel-powered Ultrabooks are here. For more information, please visit our Ultrabooks store page. Intel Core i7 Support Based on the X58 chipset, the Gigabyte GA-X58A-UD3R supports Intel’s latest generation Core i7 processors in LGA 1366 package, providing unprecedented computing power to match the performance levels you are looking for. Gigabyte 333 Onboard Acceleration The Gigabyte GA-X58A-UD3R delivers all the killer next generation features that gaming enthusiasts and power users have been waiting for by incorporating Gigabyte's 333 Onboard Acceleration features with support for USB 3.0, Serial-ATA Revision 3.0 (6Gbps) and a 3x USB Power Boost. 3 Way SLI and CrossFireX Support The Gigabyte GA-X58A-UD3R provides leading-edge graphics performance and flexibility with support for NVIDIA 2-way/3-way SLI and ATI CrossFireX Multi-GPU Technology. Ultra Durable 3 Technology The Gigabyte GA-P55A-UD3 features revolutionary Ultra Durable 3 technology with a 2oz copper PCB design to help reduce system temperature and dramatically enhance performance. Scalable DDR3 Memory Six 240-pin DIMM sockets support up to 24GB of DDR3 memory with triple channel DDR3 support (Core i7) at speeds of up to 2200MHz, ensuring ample capacity for any application. Gigabyte DualBIOS Gigabyte DualBIOS technology protects the BIOS from virus attacks. With its innovative backup BIOS design, this platform provides twice the security thus assuring the PC’s stability. (Note 1) For optimum performance, if only one PCI Express graphics card is to be installed, be sure to install it in the PCIEX16_1 slot; if you are installing two PCI Express graphics cards, it is recommended that you install them in the PCIEX16_1 and PCIEX16_2 slots. (Note 2) The PCIEX8_1 and PCIEX8_2 slots share bandwidth with the PCIEX16_1 and PCIEX16_2 slots espectively. When PCIEX8_1 is populated with an expansion card, the PCIEX16_1 slot will operate at up to x8 mode; when PCIEX8_2 is populated with an expansion card, the PC IEX16_2 slot will operate at up to x8 mode. Pros: The mother board was easy to install and get up and working. Other Thoughts: i would recommend this product. it came in fast even if it was coming from china. i thought it would take longer but it didn't. Pros: Ran great, good boot times, no stalls on post. The built in bios utility was great too. I had no problems whatsoever with any of the other components I had installed. Cons: It literally just stopped booting in less than 2 months. Roughly a month and 2 weeks was it's life. Later I found out that this particular board is common to have dead RAM slots which result in cute BSOD's every now and then. Other Thoughts: Honestly, I was hoping that I wouldn't be one of the 1-2 eggers that had a failure result. And of course I did. I'd recommend getting a motherboard that has an extremely low amount of 1-3 egg ratings. And a lot less of the DOA's and other related topics. Pros: This is a very clean looking Motherboard it has plenty of fan headers i was able to run every fan in my case off this board. I have it paired with a Intel Core i7 950 with 12gb of kingston hyper-X and two evga GeForce GTX 570 video cards and every thing posted on first boot. To the people that are having trouble booting try switching your ram to the white colored slots on the board and make sure that they are locked into place good. Cons: The only con to me is that the board is not all black in color. Other Thoughts: This was the second time i used a gigabyte board the first was with there P55 series and was able to overclock my i5 750 to 4 ghz solid where my evga board would only take it to 3.6 ghz solid. Pros: Still going strong, after 8 years, with original CPU (Intel® Core i7-950 Bloomfield 3.06GHz), GPU (EVGA GeForce GTX470 1280MB GDDR5) , PSU (Antec TruePower New TP-650) and 12GB G.Skill Trident SDDR3-2000 Tri-Channel 9-9-9-24 1.6V DRAMs. Cons: 1) BIOS updates are not kept current. 2) BIOS settings were never easy to configure or even understood clearly. 3) Gigabyte included an original installation/driver Gigabyte DVD containing a virus warm! I still get warnings on the iso disk copy file I made long time ago! Other Thoughts: I resurrected and upgraded this old gig (my sons old gaming computer) for my personal use (Windows 10 Pro 64-bit, 256GB SSD, 2x2TB SATA3 internal HDDs). It runs fast and reliably in my homes Gigabit internet. Other than my time I spent zero moolahs. I will not recommend though any Gigabyte mobo or other hardware. The company tried but never good enough. 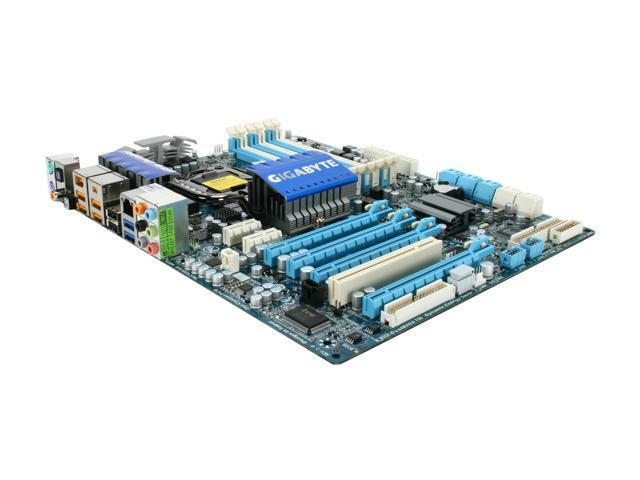 They are other mobo companies that had better products in 2010 and I should have choose them at that time. Pros: This motherboard has lasted me for longer than 6+ years. Only now am I thinking about replacing the board. Will buy another Gigabyte board after this experience. Other Thoughts: Yes, my next board will be another Gigabyte. Other Thoughts: I bought this motherboard for the gaming rig I build in July 2010 and I am still using it for gaming. Over the years I have upgraded my SSD drives a few times and I recently upgraded my RAM from 6GB to 24GB for running virtual machines. Pros: Worked great for 5+ years, this baby got me though college and has seem some ruff times but it has survived it all. (even a short circuit problem due to a faulty case USB, and a glass of water being dumped on it... <_< >_>) A+ would recommend gigabyte boards. Cons: Had a few problems with the BIOS over the years, I had to flash it once after it got messed up. Pros: I loved it a first. I loved all the bells and whistles. Cons: There are two: 1. There is no place to plug a female USB cable. This cable usually comes with cases. 2. THIS IS A BIG ONE. After having this computer for 3 years with no issues--at all. For the first time, I put the computer in sleep mode and it never woke up! I tried everything just like the guys in the other posts--nothing worked. The closest I got to any signs of power was a flash of yellow/green near the MOBO power socket, that's it.